What is a battery desulfator you ask?. It is an electronic device that cleans the internal battery plates to remove the lead sulfate that builds up on poorly maintained batteries. 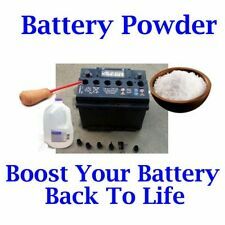 By restoring the lead sulfate back into the acid solution you can greatly extend the life of the battery by many years. New Battery Desulfator (Desulphator). However using an Auto Pulse Battery Desulfator can reverse the process. Many desulfator products use an old technology inductor design to generate the pulse to desulfate a. Repair mode for Pulse Desulfator Rejuvenation. 12V 4AH - 100AH. Auto Pulse Rejuvenator. • Rated output: 12V DC, 5-6A Max. • Output short protection: Yes. • Cooling: Fan. • Non battery link protection: Yes. 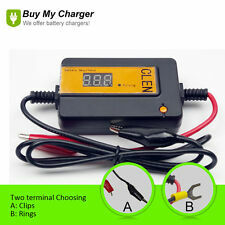 12 volt 6 volt 24 or 48 volt Deep cycle and Starting Batteries. and other lead acid storage batteries including banks of back up and storage batteries. OUR Professional KIT includes Battery Powder the battery restoration product along with. What is a battery desulfator you ask?. It is an electronic device that cleans the internal battery plates to remove the lead sulfate that builds up on poorly maintained batteries. By restoring the lead sulfate back into the electrolyte you can greatly extend the life of the battery by many years. You'll have to buy all the other parts from Mouser (I will provide a BOM) plus four #4 x 1/4in self-tapping screws. It uses a widely-available rocker switch for the main power switch and two slide switches instead of jumpers to set the output current. Battery Desulfator (Desulphator). 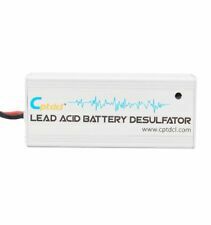 However using an Auto Pulse Battery Desulfator can reverse the process. Many desulfator products use an old technology inductor design to generate the pulse to desulfate a. Old technology also requires a large inductor so necessitating a physically large desulfator device whereas using our advanced technology design the Auto Pulse Desulfator device is very compact yet provides BIG performance. BATTERYMINDER 1500. • We will stand behind every item listed. Lead Acid Battery Desulfator Assembled Kit with Reverse POL Protection. Features: reverse POL protection. The best results for recovery will occur within the first 4 weeks. If left connected longer, desulfating will continue but at a slower pace. Plug in your 12 volts adapter to DESULFATOR input. desulfating will continue but at a slower pace. When lead sulphate crystals build up on the lead plates, it is not an easy task to remove them and thereby recondition the battery. The best results for recovery will occur within the first 4 weeks. If left connected longer, desulfating will continue but at a slower pace. When lead sulphate crystals build up on the lead plates, it is not an easy task to remove them and thereby recondition the battery. BATTERYMINDER 2012 AGM. 12 Volt 2 Amp. Trending at $78.86eBay determines this price through a machine learned model of the product's sale prices within the last 90 days. When lead sulphate crystals build up on the lead plates, it is not an easy task to remove them and thereby recondition the battery. Pulse conditioning is therefore used to ensure that only the sulphate crystals are affected and the battery does not overheat. OUR Professional KIT includes Battery Powder the battery restoration product along with. No, IT WILL NOT WORK ON A BATTERY THAT HAS a CELL SHORTED OUT. Boost 6 Battery's Back To Life. BOOST THAT OLD BATTERY NOW! Lead acid battery desulfator to revive and rejuverate batteries 12V/24V/36V/ 48V. However using an Auto Pulse Battery Desulfator. can reverse the process by dissolving the sulfates, cleaning the plates and restoring the electrolyte strength so improving a battery’s life and capacity for an extended period.The Auto Pulse Battery Desulfator/. You are watching complete component assembled kit for 12 volts lead acid battery desulfator. When lead sulphate crystals build up on the lead plates, it is not an easy task to remove them and thereby recondition the battery. This is a kit for 12 volts lead acid battery desulfator. The best results for recovery will occur within the first 4 weeks. If left connected longer, desulfating will continue but at a slower pace. When lead sulphate crystals build up on the lead plates, it is not an easy task to remove them and thereby recondition the battery. This is a 12 volts lead acid battery desulfator. The best results for recovery will occur within the first 4 weeks. If left connected longer, desulfating will continue but at a slower pace. When lead sulphate crystals build up on the lead plates, it is not an easy task to remove them and thereby recondition the battery. Desulfator device whereas using our advanced technology design the Auto Pulse Desulfator device is very compact yet provides BIG performance. 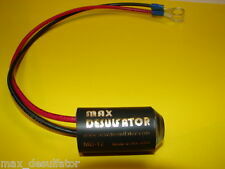 desulfator products use an old technology inductor design to generate the pulse to. MPN: 483CEC1. Manufacturer: BatteryMINDer. This unit does a complete job of charging, maintaining and desulfating 48 Volt deep cycle wet cell, sealed gel, and AGM battery systems. Cycles through the whole process, from Analyzing to Desulfating, Soft Start, Bulk Charging, Absorption, Testing and and Maintenance. Power Plug: US. Due to the secure reasons. We would try our best to solve the problem with you. The desulfator should be installed as close as possible to the battery. Features: reverse POL protection. left connected longer, desulfating will continue but at a slower pace. on your car battery or any 12 volts system. Power Plug: US. We would try our best to solve the problem with you. Case Type: wall or vehicle mountable. 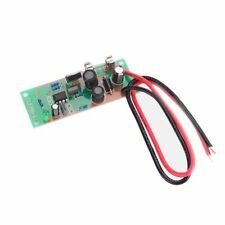 Output Volts (DC): 12v. Protects against spark, polarity and short circuit. Splash-proof construction/weatherproof case. You may need to sign in. Pet Supplies. Plug in your 12 volts adapter to DESULFATOR input. Verify that the red LED is on, you might also be able to hear a “buzzing” noise. When lead sulphate crystals build up on the lead plates, it is not an easy task to remove them and thereby recondition the battery. Lead acid battery desulfator to revive and rejuverate batteries 12V/24V/36V/ 48V/60V/72V. However using an Auto Pulse Battery Desulfator. can reverse the process by dissolving the sulfates, cleaning the plates and restoring the electrolyte strength so improving a battery’s life and capacity for an extended period.The Auto Pulse Battery Desulfator/. 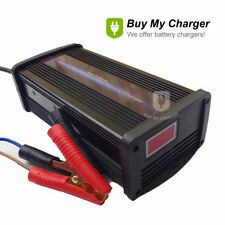 12V Lead Acid Battery Desulfator Life Extender. This desulfator can get the crystalline sulfate dissolved back to the electrolyte, thus restoring the battery function and the electrolyte strength. 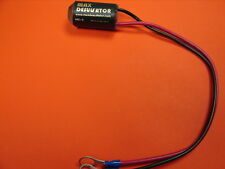 a 12v lead acid battery desulfator, black and red connecting wire(clip), black and red connecting wire(circular ring). Combined auto pulse battery regenerator. Many desulfator products use an old technology inductor design to generate the pulse to desulfate a battery. This old technology creates a harsh inductor peak that can be damaging to the battery plates. The best results for recovery will occur within the first weeks. If left connected longer,desulfating will continue but at a slower pace. SUITABEL FOR BATTERY---7-30Ah lead acid battery. Plug in 12 volts adapter. Battery desulfators can help restore and prolong the life of your batteries, including critical batteries such as the one found in your car. The product has a number of uses that span different types of batteries, including 6-volt batteries and 12-volt batteries. On eBay, you can find a large selection of affordable battery desulfators to meet your needs. How does a battery desulfator work? A sulfate buildup can cause a battery to fail prematurely. When batteries discharge, they cause sulfate to build up on the battery plates. When this occurs, it interferes with normal battery function and prevents the battery from reaching its intended life. A battery desulfator sends a high-voltage pulse to the battery. This pulse breaks down the sulfate and restores normal function to the battery. Are there many types of desulfation technology? Battery desulfation is not a one-size-fits-all term. There are many different methods that can be used for battery desulfation. Some products offer frequency-based battery desulfation. There are other products that conduct desulfation by rapid voltage fluctuation. A third type of battery desulfation is square-wave technology. What is square technology, and how does it work? Square-wave technology directly attacks each crystal of lead sulfate. In a square-wave battery desulfator, signals are sent to each crystal, which causes them to break down into lead and sulfuric acid. This is a unique method that not only can prolong the life of the battery but also rejuvenate and restore the battery. As a result, the electrical charge can now be drawn straight from the battery. What are some types of battery desulfators that are available? Battery Life Savers BLS-12/24-C: This high-powered desulfator even has models that can be used on batteries found in heavy trucks or other vehicles. Pulsetech Battery Desulfator: Pulsetech makes battery desulfators for both military and commercial uses. This brand's consumer products can work on cars and light trucks, motorcycles, small boats, ATVs and off-roaders. Cleanpower Blue: This is a lightweight and portable battery desulfator. It is able to be used on batteries of multiple different voltages. This model does not have a charger, but it is an effective model. 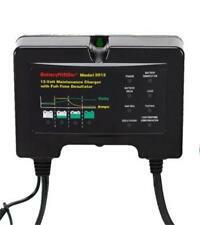 BatteryMinder 1510: This is a combination desulfator and charger. It can charge and desulfate up to four batteries at one time.